Imagine if, on the day in early April when Jiverly Voong walked into the American Civic Association Building in Binghamton, N.Y., and gunned down 13 people, you read this headline in the news: “Binghamton in shock as police investigate what some critics call ‘mass murder. '” If American newspapers, as well as the TV and radio news, were to adopt that as a form, we would, of course, find it absurd. Until proven guilty, a man with a gun may be called “a suspect,” but we know mass murder when we see it. And yet, in one of the Bush administration’s lingering linguistic triumphs, even as information on torture programs pours out, the word “torture” has generally suffered a similar fate. Torture, as a word, except in documents or in the mouths of other people – those “critics” – has evidently lost its descriptive powers in our news world, where almost any other formulation is preferred. Often these days the word of choice is “harsh,” or even “brutal,” both substitutes for the anodyne “enhanced” in the Bush administration’s own description of the package of torture “techniques” it institutionalized and justified after the fact in those legal memos. The phrase was, of course, meant to be law-evading, since torture is a crime, not just in international law, but in this country. The fact is that, if you can’t call something what it is, you’re going to have a tough time facing what you’ve done, much less prosecuting crimes committed not quite in its name. In a recent column, the Washington Post‘s Richard Cohen wrote, “What Henry Luce called ‘the American Century’ is over.” Cohen is right. All that remains is to drive a stake through the heart of Luce’s pernicious creation, lest it come back to life. This promises to take some doing. When the Time-Life publisher coined his famous phrase, his intent was to prod his fellow citizens into action. Appearing in the Feb. 7, 1941, issue of Life, his essay, “The American Century,” hit the newsstands at a moment when the world was in the throes of a vast crisis. A war in Europe had gone disastrously awry. A second almost equally dangerous conflict was unfolding in the Far East. Aggressors were on the march. Read today, Luce’s essay, with its strange mix of chauvinism, religiosity, and bombast (“We must now undertake to be the Good Samaritan to the entire world”), does not stand up well. 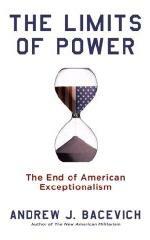 Yet the phrase “American Century” stuck and has enjoyed a remarkable run. It stands in relation to the contemporary era much as “Victorian Age” does to the 19th century. In one pithy phrase, it captures (or at least seems to capture) the essence of some defining truth: America as alpha and omega, source of salvation and sustenance, vanguard of history, guiding spirit and inspiration for all humankind. The problems with this account are twofold. First, it claims for the United States excessive credit. Second, it excludes, ignores, or trivializes matters at odds with the triumphal story-line. The net effect is to perpetuate an array of illusions that, whatever their value in prior decades, have long since outlived their usefulness. In short, the persistence of this self-congratulatory account deprives Americans of self-awareness, hindering our efforts to navigate the treacherous waters in which the country finds itself at present. Bluntly, we are perpetuating a mythic version of the past that never even approximated reality and today has become downright malignant. Although Richard Cohen may be right in declaring the American Century over, the American people – and especially the American political class – still remain in its thrall. What flag-wavers tend to leave out of their account of the American Century is not only the contributions of others, but the various missteps perpetrated by the United States – missteps, it should be noted, that spawned many of the problems bedeviling us today. The Bomb. Nuclear weapons imperil our existence. Used on a large scale, they could destroy civilization itself. Even now, the prospect of a lesser power like North Korea or Iran acquiring nukes sends jitters around the world. American presidents – Barack Obama is only the latest in a long line – declare the abolition of these weapons to be an imperative. What they are less inclined to acknowledge is the role the United States played in afflicting humankind with this scourge. The United States invented the bomb. The United States – alone among members of the nuclear club – actually employed it as a weapon of war. The U.S. led the way in defining nuclear-strike capacity as the benchmark of power in the postwar world, leaving other powers like the Soviet Union, Great Britain, France, and China scrambling to catch up. Today, the U.S. still maintains an enormous nuclear arsenal at the ready and adamantly refuses to commit itself to a no-first-use policy, even as it professes its horror at the prospect of some other nation doing as the United States itself has done. Afghanistan. President Obama has wasted little time in making the Afghanistan War his own. Like his predecessor, he vows to defeat the Taliban. Also like his predecessor he has yet to confront the role played by the United States in creating the Taliban in the first place. Washington once took pride in the success it enjoyed funneling arms and assistance to fundamentalist Afghans waging jihad against foreign occupiers. During the administrations of Jimmy Carter and Ronald Reagan, this was considered to represent the very acme of clever statecraft. U.S. support for the Afghan mujahedin caused the Soviets fits. Yet it also fed a cancer that, in time, exacted a most grievous toll on Americans themselves – and has U.S. forces today bogged down in a seemingly endless war. No, we apologize to them, but for our own good – to free ourselves from the accumulated conceits of the American Century and to acknowledge that the United States participated fully in the barbarism, folly, and tragedy that defines our time. For those sins, we must hold ourselves accountable. Previous Previous post: DOD Can’t Handle the Truth?